Google yesterday released the Pre-Beta of the new version of their web browser Google Chrome 2.0. People are still curious to know that how they can try out this new Google Chrome 2.0 Beta because alot of new features are introduced in this new version. Google is trying hard and their team is working endless nights to come up with new ideas for their web browser. Its not even been 200 days since the launch of their Google Chrome and they just came up with the version 2.0 beta. Download and Install Google Chrome. Subscribe to the developers channel. a. Download and run Google Chrome Channel Changer. b.Click the circle next to the channel you want to get updates from. c. Click Update to save your choice. e. In Google Chrome, click the wrench menu and choose About Google Chrome. f. Click Update Now to install the current channel’s release. Wait until the new version is downloaded (you may force the updatie by opening the “About Google Chrome” dialog). If you decide to switch from Dev to Beta or from Beta to Stable, the new channel will be on an earlier version of Google Chrome. You won’t get automatic updates on that channel until it reaches a version later than what you’re already running. 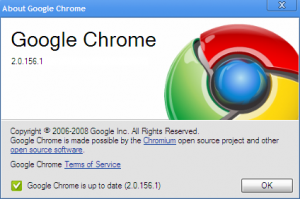 You can uninstall Google Chrome and re-install from http://www.google.com/chrome to go back to an earlier version. (If you want to be on the Beta channel, you have to run the channel changer again after re-installing). If you re-install an older version, you might find that your profile is not compatible (because the data formats changed in the newer version you had been running). You’ll have to delete your profile data. Delete the User Data\Default folder (see the Before You Change Channels section above for the location). If you made a back up of your Default directory, you can then rename it to Default so that you at least restore some of your previous bookmarks, most visited pages, etc.